Ausenco has built a reputation on the delivery of innovative and cost-effective project solutions for mining clients, a philosophy that is carried through to its work in the transportation and bulk terminal market,” writes Joel G. Shirriff, P.Eng., GM Optimization & BD, North America, Global Practice Lead,Terminals & Transportation. Ausenco brings value to all its clients’ projects, from the concept development phase through to engineering, procurement and construction management (EPCM), commissioning and operations. It should come as no surprise that the demand for new bulk shipping terminal capacity is closely tied to the development of new mining and mineral projects. Challenging commodity markets are not only driving a need to reduce costs at the mine sites, but also for the outbound logistics and terminal infrastructure required for these projects. Whether the project requires a new greenfield terminal or the upgrading of an existing facility to take on another product stream, customers expect results with minimal capital outlay to help maintain project feasibility, while sustaining high levels of operational efficiency, environmental sensitivity and safety. A recent example of Ausenco’s value-add philosophy in action is its delivery of the rail and port solution for TiZir’s Grande Co^te Mineral Sands Project in Dakar, Senegal. On 30 June this year, this project won the ‘Premier Transport Project of The Year’ category at the 8th African Transport Awards. Ausenco’s project scope included two main components: rehabilitation of the railway from the mine to Dakar: rebuilding 100km of existing railway and construction of 25km of new railway; and construction of a new storage and shiploading facility in the Port of Dakar. Ausenco collaborated with Tizir to fully understand its needs in the development of terminal concepts, and worked with a number of equipment vendors to incorporate their specialized products into a customized solution that would not only work in the tough African environment, but offer a cost-effective means of moving their product to market efficiently and safely. The port component of the work presented two main challenges: making use of an existing brownfield site with limited access for train receiving and storage, and loading bulk carriers with product at an existing wharf shared with other general cargo users. Because Ausenco offered its client a holistic transportation solution, it was able to optimize the train configurations in combination with how they could best be managed at the port. The customized bottom dump wagons are discharged at the port using a special ‘low profile’ belt feeder system to minimize excavation on site. This mineral sands cargo is both valuable and water sensitive, and needed to be stored in an enclosed building. Using its global procurement team, Ausenco sourced a very reasonably priced pre-fabricated steel building from a vendor in Egypt, which was shipped in modular sections to ease erection requirements on site. Often, covered storage systems incorporate an overhead conveyor to drop cargo to the floor, but in this case Ausenco strategically opted for dual radial stackers along the wall of the building to reduce the structural loads on the building and provide redundancy in the equipment. Reclaim of product from the building is done with front end loaders into fixed hoppers that feed onto a common belt conveyor. As the storage site is remote from the loading berth, a pipe conveyor is employed to negotiate the multiple obstructions posed by existing infrastructure. Not only did this concept with its combination of horizontal and vertical curves reduce the number of separate conveyors and transfers employed along the route, it provided an enclosed system to minimize the potential for spillage and dust. The need to share the berth with other port users requires a mobile shiploader to be used, and the pipe conveyor discharges to a series of portable grasshopper conveyors that, in turn, feed a self-propelled shiploader on rubber tyres that includes shuttling and luffing functions on the boom to load Handysize ships at 1,200tph (tonnes per hour). Once loading is complete, the machines are moved into a secure storage area to free up the dock. This project presented intriguing design challenges, as well as a range of challenges in project delivery and execution due to brownfield conditions in an existing congested African port, with a scarcity of skilled trades in the region. Maximizing modular construction and pre-assembled materials handling equipment was a critical element in both minimizing the capital costs, and simplifying the site works and the labour requirements to complete the installation. Ausenco managed a number of different local and international contractors during the project implementation, and completed the project with zero lost time accidents on more than three million man-hours of work. This impressive accomplishment was due to good planning during the early design of the project, and good management of the site activities which included the training and engagement of the workforce to take ownership of Ausenco’s ‘Zero Harm’ philosophies. works for one operation may not necessarily work for another. Each project has its own specific drivers ranging from commodity type, geographic location, constructibility, project life, levels of automation, and maintenance expectations. Ausenco strives to not only provide a cost-effective design for its clients’ initial investment, but also to minimize the total cost of ownership seen over the project life cycle. Customizing the terminal design to meet all these needs is vital to deliver the desired results. At Ausenco, staff are proud to provide ingenious solutions for the company’s global clients in the bulk terminals sector. Ausenco is a global, diversified engineering, construction and project management company providing services in Minerals & Metals, Process Infrastructure, Environment & Sustainability, and Oil & Gas.The company delivers new and better ways to add value to clients’ projects no matter how demanding and it delivers results in some of the world’s most challenging environments. Listed on the ASX in 2006, Ausenco’s growth strategy is focused on sector, solution and geographic expansion. The company operates from 31 offices in 19 countries. TiZir Limited is a vertically integrated zircon and titanium business which owns the Grande Co^te Mineral Sands Project in Senegal and the TiZir Titanium and Iron Ilmenite Upgrading Facility in Norway. The company is jointly owned 50/50 by Mineral Deposits of Australia and Eramet of France. TiZir benefits from Eramet’s broad expertise in mining, metallurgy, logistics, R&D and marketing, and from Mineral Deposits’ development expertise and mineral sands mining experience. Continuing voracious demand for mined materials in China, India, and other developing nations, has led to an associated requirement for increased bulk terminal capacity for both export by suppliers and import by users. Whether developing an existing facility or building from scratch it is imperative that any scheme is planned in advance from engineering, commercial and operational perspectives in order to deliver maximum value to the customer. Rajan Narayan,Technical Director at BMT Consultants India, a subsidiary of BMT Group, provides an overview of current themes in the market. Despite a dip in demand in early 2015, China remains the world’s top coal consumer, accounting for almost a quarter of the global trade and importing 291.2mt (million tonnes) in 2014. Coal shipments to India, the world’s third-largest importer, rose 19% to 210.6mt in 2014 driven by demand from the energy sector. Despite having access to locally mined coal or iron ore, demand for better quality materials from abroad, either to reduce emissions, improve heat rates or for use in higher specification manufacturing processes, will continue to increase the volumes of bulk materials being transported. Considering the huge quantities involved, the consistency of demand and the pressure on price, sea-transport is the most commercially viable mode of transport. Furthermore, pressure on road and rail systems and the growing awareness of environmental factors makes sea transport ethically acceptable too. Perhaps it is not surprising that more than 90% of the country’s coal imports are seaborne, according to the China National Coal Association. Developing countries in Africa and South-East Asia with access to coal, iron ore and other raw materials are responding to this demand by investing in bulk shipping terminals and the necessary infrastructure required to support them. Finance for these terminals is being provided by both governments and private organizations: government-financed terminals tend to be developed to support and promote the needs of local or regional business while privately backed facilities are predominantly used for the owners’ sole benefit. BMT is supporting the development of these facilities by providing professional support to clients throughout the life-cycle of a project from initial concept, through master planning, assisting the client in demonstrating the robustness of their business plan as part of securing funding, obtaining the necessary permissions to proceed and adding value as part of the peer review of detailed design. Early involvement in itself can add value for the client as it negates the risk of issues coming to light later in the process leading to a redesign. The planning process for developing an existing facility or building from scratch will involve identifying the best compromise between whole-life cost and operational efficiency and flexibility. In order to make an informed decision it is important to fully understand all the factors that will impact on the design and specification of a bulk terminal. A prime example of this involves the possible provision of a breakwater or other sea-defences to provide protection against bad-weather during ship unloading. A larger, more expensive breakwater will provide a wider working window for loading or unloading; however a smaller breakwater might be more cost-effective over the life of the project depending on the prevailing weather conditions and historical frequency of storms, the types of vessels using the facility and the cost of non-productive time of dockworkers and uploading plant waiting for bad weather to pass. Another key issue that must be considered in a wider context is the size of vessel that will visit that facility. The unit cost of transporting coal or iron ore by Panamax can be as much as 50% more than by Capesize so consequently ship size must be taken into account, from both commercial and engineering perspectives. Larger vessels including Very Large Ore Carriers/Ultra Large Ore Carriers may be more cost-effective purely in terms of direct unit cost, but ancillary costs such as the potential requirement for tugs, pilotage and maintenance dredging must be taken into account. For clients generating power, or producing products such as steel, a key requirement is ensuring a sufficient supply of raw materials to keep the plant running in any situation short of force majeure. These heavy industries require large quantities of power, fuel and raw materials and cannot easily shut-down if supply is interrupted. Consequently, suitable consideration needs to be given to proving suitably large stockyards to hold raw materials for an agreed number of days of production without resupply. Furthermore, the material handling facilities from dockside to stockyard and then stockyard to factory or power-station must be specified to deliver both suitable capacity and reliability in line with operational requirements. It’s not uncommon to see up to 12,000tph (tonnes per hour) of bulk material moved in the terminal environment so material handling equipment must be fit for purpose with suitable redundancy built-in. Additional storage space and material handling equipment with high availability will have a commercial implication so part of the planning process will inevitably involve cost benefit analyses within the operational parameters to demonstrate best value to the client. Global demand for material handling equipment is projected to increase 5% annually by 2018 to $142 billion providing a buoyant market that is enable manufacturers of materials handling equipment to invest in new technology. While use of automated storage and retrieval systems and automated guided vehicles is already seeing strong growth in the US and Australia, lower levels of technology are still likely to be deployed in Africa, India and China over the next few years. In order to develop the most effective, efficient and commercially sustainable bulk terminal, initial planning must develop design parameters based on the client’s budget, commercial and operational requirements as well as the physical and environmental constraints inherent in the site. By developing a homogeneous design philosophy, ideally with early involvement from the planning and design teams, it is possible to develop a facility that optimizes utilization as far as reasonably possible while minimizing the risk of demurrage, double-handling of materials and delays. It is a world leader in environmental projects, and one of the ten largest companies involved in Engineering & Management Programmes in the US. currently has more than 25,000 global employees, who have the 80% ownership of the shares of the company. CH2M is characterized by the development of highly complex projects in engineering and construction management, in areas such as transport infrastructure, water, oil & gas, mining, manufacturing and pharmaceutical, power generation and environment. It has several awards in the US as one of the leading engineering companies, one of the 50 best companies to work, and for his work in relation to environmental protection. CH2M is at the forefront of planning, designing, and managing construction of new and existing bulk terminals to meet the ever-increasing demand and latest technological developments in bulk solids handling, processing and storage. It provides the highest technical quality services to support the rapid growth of bulk cargo worldwide. The company has successfully delivered projects around the world to handle this increased traffic, and have been responsible for the planning, engineering design and construction supervision of many of the most world’s technically advanced bulk handling operations. CH2M has the ability to offer services across over the complete programme cycle from initial concepts to construction management. It offers a full programme management service using world class suite of tools in the business. Should the client wish to undertake programme management services ‘in-house’ CH2M can provide additional support as required. The company’s economists prepare detailed financial models to help clients with their business cases and its engineers create concept layouts, preliminary design, and detailed engineering design. CH2M also has experience in using various contract models and can package bid documents as desired by clients, be following its CSI-based typical standards and methodology or client-specific forms. assistance during maintenance and commissioning. Terminal planning and design: CH2M combines the operator’s perspective with technical expertise in bulk materials handling systems planning, and design resulting in a technically superior design that is operator friendly. CH2M works with clients to minimize investment and operational costs while maximizing the throughput capacity of the system. Retrofit of existing facilities is becoming increasingly high on the agenda to allow terminals to grow in the future. Dredging, reclamation, and breakwater: CH2M has extensive experience in specifying dredging in all types of materials from soft silts to hard rock, and have knowledge of many different types of dredger and dredging techniques. Many dredging projects undertaken in the past have also involved reclamation to form the new base for construction of ports and other structures, and CH2M has significant expertise in the design and construction of reclamation schemes. It also can design for a range of coastal schemes, including use of different structural forms/ layouts to suit different geophysical and hydrodynamic conditions, based on mathematical modelling. Shipping studies: CH2M’s engineers are adept in performing traffic simulation for single ports or for network of routes; assessment of shipping route reliability, potential for delay, and effect of other traffic; maritime safety and risk studies; hazard assessments (threat, probability, consequence, mitigation measures); evaluation of berth utilization/throughput; and navigation restrictions. Navigation simulation: CH2M has directed navigation manoeuvring simulations for approach channels and turning/ berth basins for USA Gulf Coast and Middle East LNG terminals. The models were equipped to reflect the presentation the mariner would expect to see on the ship’s radar and bridge, and the simulations were performed using up to 250,000m3-capacity LNG carriers. Ship assist tugs were included in the models. Mathematical modelling: Numerical modelling of the coastal and maritime environment plays an important part in port design. CH2M has a longstanding international track record for success in applying advanced modelling techniques to investigate wave transformation and agitation, sediment transport, current regimes, and hydrodynamic flows. Berth design: CH2M’s staff possesses static and dynamic mooring analysis capabilities to determine passing ship effects. The company is experienced in layout and selection of fendering and mooring points to suit vessels’ dimensions, and expected berthing and mooring techniques. CH2M understands and takes into consideration different structural forms to suit different duties and conditions. Its staff can assist in the design of jetty furniture and local infrastructure as well as the layout of access trestles, loading platforms, mooring and breasting dolphins, catwalks, as topsides facilities. Bulk materials handling equipment: Operators need to handle bulk products in a flawless and reliable system in order to minimize operative issues and handling costs. CH2M’s experience in study, concept design, cost estimate, sizing, detailed design, performance specification and procurement, delivery, assembly, installation, testing and commissioning support of state- of-the-art bulk handling systems including belt conveyors, belt feeders, vibratory feeders, hoppers, silos, shiploaders, ship-unloaders stackers, reclaimers, screening systems, crushing systems, railcar or trucks loading or unloading systems, dust collection or suppression systems, allows to support clients in all aspects of bulk handling equipment specification procurement and upgrade. product flow analysis, technology selection for the stacking or reclaiming equipment. CH2M develops this kind of service with its own professionals and specialists or in some specific cases with world class specialized consultants. Dock equipment: Operators need to unload and load vessels in the shortest possible time in order to minimize the ship’s time in port and the associated costs. CH2M’s experience in performance specification and procurement, delivery, assembly, installation, testing and commissioning support of mobile and stationary shiploaders and mobile, stationary, continuous or grab- type ship unloaders, allows to support clients in all aspects of Bulk handling equipment specification procurement and upgrade. Logistics integration: bulk terminals are often associated to other land transportation infrastructures as a component of a larger logistic system. Handled products are often received or dispatched by railroad or regular trucks. CH2M can provide an integrated engineering package including railroads, railcars handling and storage infrastructure, railcars loading or unloading systems, roads, truck parking yards, trucks loading or unloading facilities and others. Support structures and facilities: CH2M can deliver a complete multidisciplinary terminal engineering package covering all required support structures and facilities design, including earthworks, dredging, marine structures, roads and railroads design, foundations engineering, conveyor galleries and transfer towers structural engineering, architectural design, landscaping, electrical power distribution, fire protection, CCTV, access control, instrumentation and control systems, utilities generation and distribution, drainage collection and treatment and others. KSPC/PCT Potash Handling Facilities – FEL and EPCM brownfield project for a 2.2mtpa (million tonnes per annum) capacity potash export system integrated with PCT’s existing sulphur, glycol and canola handling infrastructure located in Port Moody, BC, Canada. gowest project – voestalpine – EPCM greenfield for a 2mtpa capacity hot briquetted iron production facility located in La Quinta, TX, USA. confidential project and client – owner’s engineering service for a coal fired power plant unloading berth, storage and handling system located in Thailand. Potasio Ri´o Colorado – Vale – conceptual, basic and detailed engineering for the development of a 4.3mtpa potash export sea port and compaction plant operation located in Bahi´a Blanca, Argentina. confidential project and client – feasibility study for a granular urea handling and shiploading trough for an existing sulphur handling system located in the United Arab Emirates. Renova Soybean oilseeds crushing plant – conceptual and basic engineering and EPCM for a complete soybean oilseed crushing plant of 6mtpa located in Timbues, Argentina. 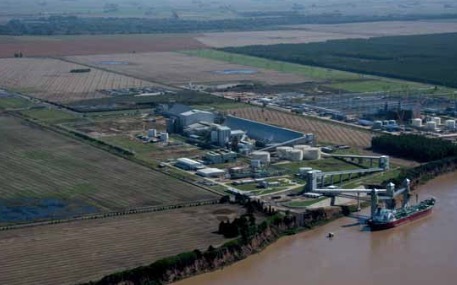 Corumba´ – Vale – Conceptual engineering for the development of tree river ports and a railroad loading facility located in Brazil and a sea port located on Uruguay. These four installations compose different technical alternatives for the 20mtpa iron ore export logistic chain from the Corumba´ mine located in Brazil.